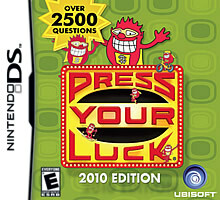 Note: Copy any of the above Press Your Luck 2010 Edition (USA) rom download links and paste it into your browser to download. Let me be annoying and point out the obvious. This page is for PRESS YOUR LUCK 2010 EDITION. The links are for HOT WHEELS BATTLE FORCE 5. Links updated, Thank you for reporting.